Build with us in Crete! sea-view in Milatos with a building license. This building license is for a house 135.m2 traditional stone build. the house for our custumers. Our builders are proffesionals in building stone houses. our building work here in Milatos. The house was finished in 0ktober 2006. Our next protject will start in 2007 in Milatos beach. with a panoramic sea view. two bathrooms and a garage. build next to the other one. with open fire place and two bath rooms. 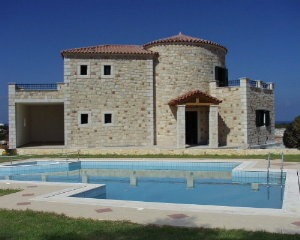 We could also build your dream house here in Crete.